This 5-day class begins with design exercises for creating “simple strip-pieced fabrics” in color and value that will then be used in a medium size composition; as participants compose this initial composition, they will be challenged to work intuitively. Next, participants will begin working with their large palettes of colors, cutting out, designing, and sewing a wide variety of exciting strip-pieced fabrics based on “fabric descriptions.” After finishing these fabrics, participants will be given new design exercises in which they are introduced to the concept of “restructuring;” participants will begin the process of thinking about how fabrics can be cut up and re-combined or restructured into new fabrics or small compositions or studies. Design exercises will progress from simple to more complex, resulting in a series of sewn-together quilt tops (known as compositions). Strip-piecing is a way of creating a “fabric vocabulary” out of existing fabrics that have been cut selvage to selvage. It is an invaluable way to learn more about color, value usage, and proportions in a very fluid manner. Participants will work freehand without the use of a ruler. All exercises will be done in direct machine-piecing technique. Please come with an open, sponge-like mind with no agendas, ready for growth and for risk-taking. Note: We will use everything listed above so do not decide to leave anything out! Do not bring fat quarters. We will be cutting strips selvage to selvage. Bring enough variety so you are not hamstrung. Please wash and shrink all fabrics. Long ago I identified fabrics as a medium that could/would fascinate me as long as I had ideas worth exploring. I have always aspired to be a great machine-piecer and a great craftsman. Along the way, I resolved to understand and execute “dead-on” spacing, a goal that has become an ongoing education in careful observation of what spatial tension means to me. Another goal has been to dye more adventurous and unusual shades of any color. I am rigorous in my work habits and expectations so it seems natural to state that I always wanted to develop a body of work that underscored how truly I believe in myself and my willingness to work hard. I started cutting up cotton fabrics when I was ten years old or younger. Those fabrics were always leftovers from some other project such as apron-making. Today I buy a thousand yards of cotton and individually dye the yardage myself to my specifications for saturated opacity based on formulas worked out over twenty years. The fabrics dyed and stacked, I look them over, choose a palette and start cutting improvisationally from one, maybe two layers of color. I cut parts and pieces, more specifically, lines and shapes. Observing and then pausing in my observations, I pin these shapes and lines slowly (sometimes amazingly quickly) onto my huge pin walls, forming compositions that interest me, intrigue me. There are no drawings to follow, just glimpses into possibilities as configurations begin to evolve. When I have pushed and pounded the growing structure in front of my eyes into something worth sewing together, I start the process of taking down the parts and machine piecing them together, section by section. I make changes, adding new lines and shapes or taking some out; I keep the process fluid, until the composition is completed. My approach to composition is like constructing a building; I am totally engaged. That is why I love the process, the discoveries; that is why I love and need to make quilts. A great machine-piecer is a very rare phenomenon in our society today. Society neither appreciates nor understands the skill involved. It takes years and years of practice to train the muscles in one’s fingers, hands, and arms to cut the right sizes of any line or shape by eye, to know internally how much each will reduce when sewn so that the composition still holds together. Unlike a painter, a machine-piecer cannot take a brush and make a line thinner or thicker; rather the machine-piecer has to cut a new piece. Often a favorite color has to be dyed in five 2-yard increments so there is always enough to correct errors. I am my own advocate. I will always be my own advocate. I drive myself because it is what I am, who I am, what I know, what I want for myself. I try very, very hard, often struggling, to keep close to the earth, to stay humble, to understand what is true for me and to protect my time for creation. In this world today, more than ever, it takes absolute conviction to preserve the time, to preserve the energy, to preserve one’s creativity, to preserve one’s brain for oneself and the work, to stay focused and to get the work done. Artist Nancy Crow has been making quilts for over 30 years and maintains a large studio and teaching facility on her 90 acre farm east of Columbus, Ohio. Nancy was named a Fellow of the American Craft Council in 1999 and in 1996 received two major awards: Individual Artist’s Fellowship from the Ohio Arts Council and The National Living Treasure Award from the University of North Carolina at Wilmington. She has had major solo exhibitions at the Renwick Gallery/National Museum of American Art/Smithsonian Institution and at the Museum of Arts & Design in New York City. In 1998, she had a one-person exhibition at the Cultural Arts Museum, Konstanz, Germany. In 2005, she had major solo exhibitions in New Zealand at the Auckland Art Museum and the Hawke’s Bay Exhibition Centre. In 2008, she had a major solo exhibition at The International Quilt Study Center & Museum, The University of Nebraska, Lincoln, and most recently, an exhibition of 55 quilts at Carnegie Mellon University’s Regina Miller Gouger Galleries, Pittsburgh, Pennsylvania. 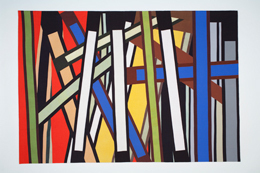 In 2009, she exhibited a large body of work at The Butler Institute of American Art, Youngstown, Ohio, and in 2010, she had solo shows at The Fuller Craft Museum, Brockton, Massachusetts, and at The Schweinfurth Memorial Art Center, Auburn, New York. She was the curator for a major exhibition titled COLOR IMPROVISATIONS, which opened in Stuttgart July 2010 and is now touring Europe through 2013. This exhibition was curated from the work of her advanced students and focuses on great machine-piecing, color, and individual voice. She has been invited to be a part of a major overview of important artists whose medium is textiles titled INNOVATORS AND LEGENDS, opening December 14, 2012, at THE MUSKEGON MUSEUM OF ART. This exhibition will explore the explosion of fibers as a fine arts movement over the past century up through the contemporary artwork of four generations of artists. Nancy teaches quilt making as an art form emphasizing figure/ground composition using improvisational techniques that allow for enormous personal interpretations. She has taught in Finland, Denmark, Belgium, Ireland, Austria, England, Germany Switzerland, Spain, Australia, New Zealand (where she will teach for three weeks in January 2013), Japan, Canada, and South Africa (where she taught in August 2009 at a retreat in the Drakensburg Mountains). She is represented by the Snyderman Gallery in Philadelphia, Pennsylvania. Her new book, Nancy Crow, Breckling Press 2006, is currently available and covers the last 20 years of her work. A catalogue titled Crossroads: Constructions, Markings, and Structures was published in late September 2007 by Breckling Press for her solo exhibition (of brand new work produced from 2006-2007) at the Snyderman Gallery, Philadelphia, and is also available. In addition, she authored the catalogue Color Improvisations which accompanies the 2010-2013 exhibition she curated.